grand final on Saturday at Cadbury No. 1. GRETNA II knocked off Southern Cricket Association Fourth Grade favourites DOSA in a close rain-affected grand final at Cadbury No. 1 on Saturday. The match started an hour late due to a heavy dew which reduced the encounter to a 45-over match. Gretna won the toss and elected to bat, making a competitive total of 169. Openers Jordan Hastie (11) and Bruce Emery (43 with four fours) put on 48, getting their team off to a good start. While Gretna lost some quick wickets, all-rounder Matthew Eyles batted well and made a fine 52 with six fours to boost the total. Dylan Pearce also hung around for a handy 15. In reply DOSA made very slow work of it, which was due to the great fielding and bowling by the Gretna players. Player of the match Peter Jelkic bowled extremely well, taking 4-22 as did Matthew Eyles with 2-25. Adam Browning bowled tightly 2-32. When DOSA was 8 for 153 and needing 17 off eight balls, the match could of gone either way until Brock Nichols took two wickets in a row and Gretna was the winner. The fielding was far the best seen in a grand final for some time and mention must go to Jordan Hastie for his two great catches. The first was a real team-lifter. It was a great scene at Cadbury No. 1 on Saturday and congratulations go to Gretna II captain Joey Eyles and his team for a job well done. A special mention must go to DOSA captain Tom Curtain for his speech after the match. He showed great respect to Gretna after his team's loss and this was noted by all present. 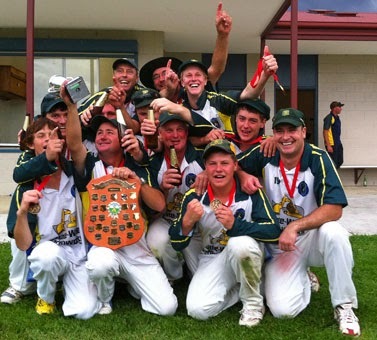 Well done to Gretna for its first premiership in the SCA and first flag since 1999/2000 when it defeated Molesworth I in the DVCA under the captaincy of Leigh Bygrave. Gretna II 10 for 169 off 45 overs (24 extras) d DOSA 10 for 153 off 43.4 overs at Cadbury's No.1. Batting - Gretna: M. Eyles 52. B. Emery 43. D. Pearce 15. J. Hastie 11. Bowling - DOSA: Z. Nossiter 4-38 (8). M. Hamilton 3-20 (9). M. Brown 2-20 (9) J. Cardon 1-23 (5). S. Beswick 1-39 (9). Bowling - Gretna: P. Jelkic 4-22 (9). M. Eyles 2-25 (7). B. Nichols 2-31 (7.4). A. Browning 2-32 (9). Player of the match: Peter Jelkic.